Who is this Bavarian Pilot? This is an interesting photo of a Bavarian Air Service pilot. 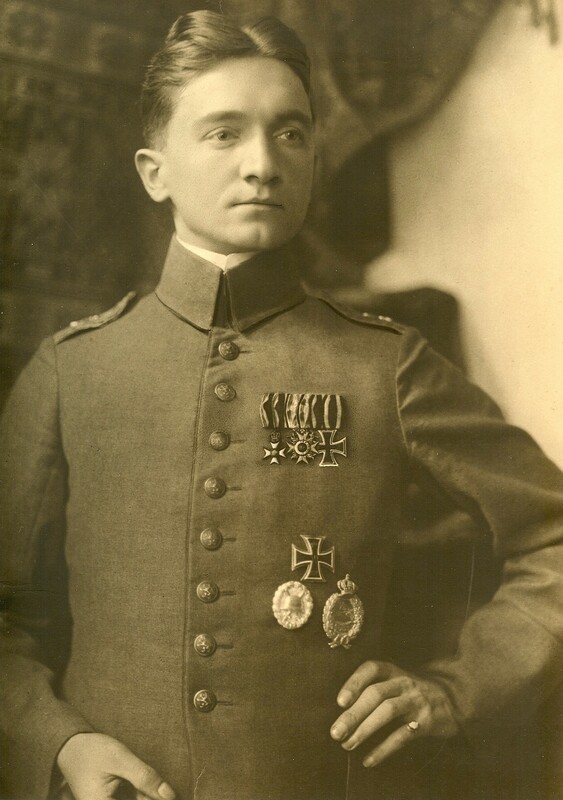 He is wearing a large medal bar with the Military Max Joseph Order Knight’s Cross, a Bavarian Military Merit Order IV Class with Swords, and a Prussian Iron Cross 2nd Class. These awards appeared to have been artistically “added” to the photo, or were enhanced by an artist to add detail. Sometimes artists added awards to a photo to update the photo with the recipient’s most recent awards after the recipient had died and it was therefore not possible to take a new photo. Also, if certain details on a photo were out of focus, artists were sometimes utilized to enhance the image. Image 1: Photograph of a Bavarian Air Service pilot. Image from author’s archive. 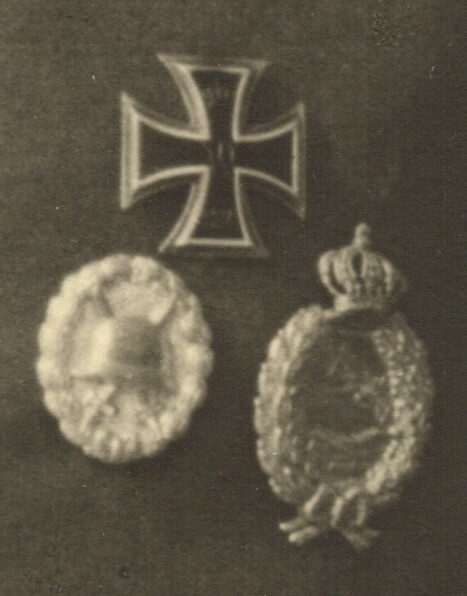 The pilot is also wearing his Prussian Iron Cross 1st Class, an Army Wound Badge (Verwundetenabzeichen für die Armee) most likely in “silver” (mattweiß) for three or four wounds, or possibly, but less likely, in “gold” (mattgelb) for five or more wounds, and a Qualification Badge for a Bavarian Pilot (Flugzeugführerabzeichen). The interesting feature of the Pilot’s Badge is that is a badge that is was originally a Prussian-type Pilot’s Badge that had an Imperial Crown. The Imperial Crown was removed and a Bavarian Royal Crown was added by a jeweler. This is believed to have sometimes been done by the recipients who were Bavarian due to a shortage of commercially-produced Bavarian Pilot’s Badges at the time. These awards appear in the photo to not have been artistically enhanced. The presence of a Army Wound Badge indicates that this photo was taken in 1918, or thereafter, as the Army Wound Badge was founded on March 3, 1918. This fact will be very important in determining who the pilot in this photo is. The pilot is wearing a Bavarian (as indicated by the buttons) field-gray Officer’s uniform. The pilot is also wearing a ring on his left hand which is of a distinctive design. Image 2: A close-up of the pilot’s large medal bar. Image from author’s archive. Image 3: A close-up of the pilot’s other awards. Image from author’s archive. 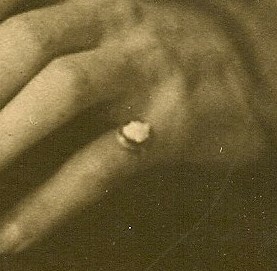 Image 4: A close-up of the ring on the pilot’s finger. Image from author’s archive. Thus, of the eleven (11) recipients, only seven (7) of them were pilots. On September 26, 1916 Leutnant Mulzer died during a test flight. On August 21, 1917 Oberleutnant Eduard Dostler was killed-in-action. On November 15, 1917 Leutnant Hans Adam was killed-in-action. On January 9, 1918 Leutnant Max Müller was killed-in-action. Since the pilot in the photo is wearing an Army Wound Badge, Leutnant Mulzer, Oberleutnant Dostler, Leutnant Adam, and Leutnant Max Müller can be eliminated from the list of possible Officers. Photographs of Ritter von Greim, Ritter von Röth, Ritter von Schleich, and Ritter von Tutschek are often seen. 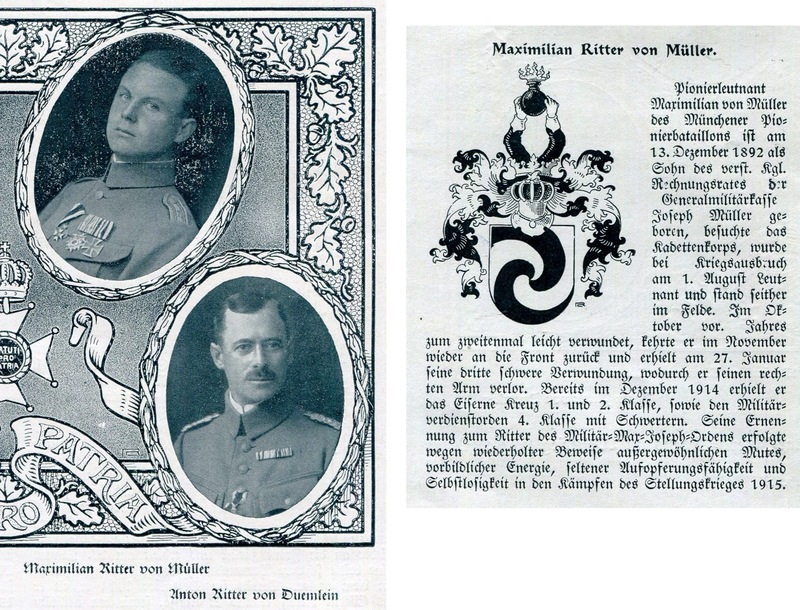 I have never seen photographs of Ritter von Benz, Maximilian Ritter von Müller, and Ritter von Reiner however. So which one of these seven (7) pilots is this a photograph of? Do you know? What are your thoughts? 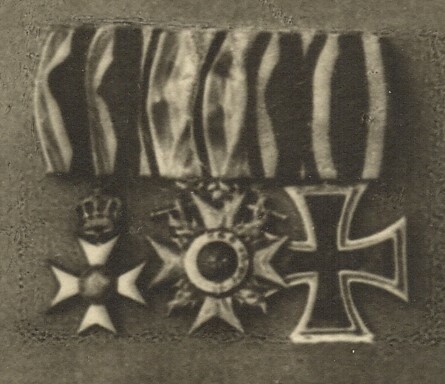 O’Connor, Neal W., Aviation Awards of Imperial Germany in World War I, Volume I – The Aviation Awards of the Kingdom of Bavaria, Foundation for Aviation World War I, Princeton, New Jersey, USA, 1988. I can show a picture of Maximilian von Müller. The awards are also. He had several injuries. See pictures. However, he lost his right arm, which in the certainly brought the Golden VWA. On the screen, but recognizes that he has both arms. Could be also a photo montage. Thank you very much Walter for the photograph of Maximilian von Müller. He is certainly a possibility for the unidentified pilot. They don’t seem to look exactly alike, but it is difficult to be certain. The photograph that I have listed could definitely be a montage as noted. The large medal bar was certainly added to the photo. The other awards could also have been added to the photo, making the date of the photo uncertain. It therefore could be Maximilian von Müller in the photo, prior to the loss of his right arm. I appreciate your comments! Hi, especially also the Bavarian aviation badge I notice, which is hardly an awarded original. The Crown appears to be slotted worked and set off towards the front. Especially, I can recommend http://www.sanke-cards.com and http://www.frontflieger.de when searching for images. At http://www.frontflieger.de is a picture of Ritter von Benz and others to see. Thank you Walter for the links to these great websites. I will look for the image of Ritter von Benz. You are correct about the Bavarian Pilot’s Badge, it is a rather unusual modified piece. The more that I look at this photo, the more I am convinced that this may be an early photo of Robert Ritter von Greim. Although this pilot’s hair is parted in the middle, and in known photos Ritter von Greim’s hair is parted on the side, such a style change is a possibility. The ring worn on the small finger of the left hand is also consistent with Greim, as he was known to wear a ring on that same finger.